I can eat everyday for my dinner a sandwich with any filling especially with loads of salads and veggies. I can have even leftover stir fries with some toasted bread slices for my dinner as sandwich. For our third week of blogging marathon, its gonna be sandwich as theme which i choosed immediately as i loved this theme very much. For the first day of this three day blogging marathon, i went for a easy breezy, healthy and delicious,super filling sandwich with cooked cauliflower florets and mayonnaise,both together works out wonder and even my picky eater enjoyed thoroughly as he loves mayonnaise very much. This sandwich is one of the easiest sandwich and obviously one of the best and better way to sneak this wonderful veggie cauliflower.Check out the other marathoners running this 21st edition of blogging marathon here.Sending to Jacqueline's No Croutons Required-Sandwich and to Vandana's Sandwiches and Burgers - Food Fun. Mix the cooked cauliflower florets and mayonnaise together in a bowl, you can add finely chopped fresh herbs here. 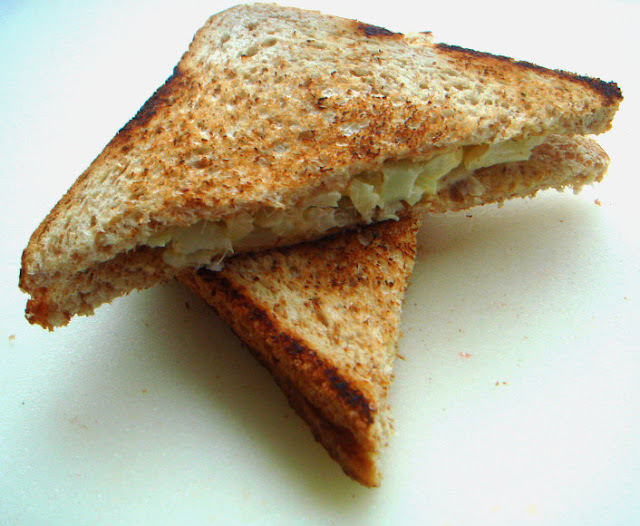 Take the toasted bread slices, spread generously the already prepared cauliflower-mayonnaise spread and close it with an another bread slice. Nice combo I never tried Cauliflower in Sandwiches...I will try soon. very off the beat combination. :) Good effort Priya. Très bonne idée, ce sandwich. J'en fais avec du concombre crus en lamelles. Une autre manière de manger le chou-fleur qui me plait beaucoup. A very filling sandwich ..
Priya...can I grab that sandwich now? inviting dear..join me in fast food event - vermicilli . Wow that is so tempting Priya..very helpful for a quick bite! We have every morning and evening bread, in the evening it is open sandwich than closed one and it is always non. Love the idea of cauliflower ones. Easy but super innovative and interesting yummy sandwiches. Delicious n healthy breakfast to munch!!! Check Out my "Daily one neivedhyam happening for 9 days of Navratri"
loved the coating of veggies with mayonaisse ,kids will love it..Yummy brekafast!! This is a veggie version of a cold chicken sandwich. Love it. ok...YUM! I love the creativity of it and use of cauliflower. It reminds me of my friends favorite sandwich of peanut butter and lettuce, it is a divine combination. Versatile i should say !! this is a nice idea for a sandwich.. i love sandwiches n have to try these! Cauliflower is an interesting filling indeed! I love cauliflower a lot.. must be a tasty sandwich :)Healthy...!! Wow!! Cauliflower filling sounds interesting and unique! It's such a brilliant idea to eat more veggies! when I think of sandwich, I have to say cauliflower is the last thing that would come to mind as filling...interesting and healthy idea! THats a new filling for me. Will try sometime.